A technology breakthrough can occasionally change an entire industry. Arlyn Scales has accomplished this with our exciting, newly patented Ultra Precision Scales. 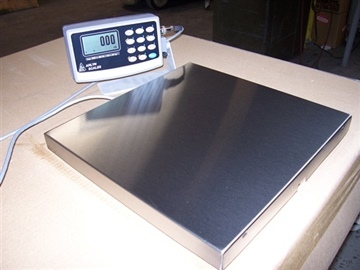 Using an all digital Surface Acoustic Wave (SAW) transducer, these scales provide more than 10 times better accuracy than any other scale in its price range. As a bonus, they are also more rugged than regular scales, and can be used in a wide variety of industrial environments. Arlyn Scales is a leader in the design and development of technology for theweighing industry. Headquartered on Long Island, New York, our company has been manufacturing electronic weighing systems for more than thirty years. Whatever your needs, from the most sensitive laboratory balance, to high capacity pallet scales, our highly trained sales staff will expertly match them with the appropriate Arlyn Scales product. If you don't see the exact item you're looking for, or you have questions, see if the answer is on our Frequently Asked Questions page, or call us toll free, 877-540-7934, Monday through Friday, from 8:00 am to 5:00 pm Eastern Time. send an e-mail to sales@arlynscales.com.